LAS VEGAS, NV, JUNE 26, 2017 – Today at Cisco Live, Cisco’s annual IT and communications conference, NetBeez announced that it is showcasing their network monitoring agents as a Cisco Preferred Solution Partner. The Internet of Everything (IoE) continues to bring together people, processes, data and things to enhance the relevancy of network connections. As a member of the Cisco Solution Partner Program, NetBeez is able to quickly create and deploy solutions to enhance the capabilities, performance and management of the network to capture value in the IoE. 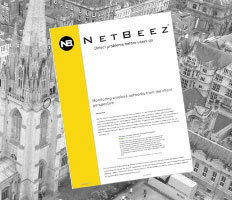 NetBeez is a user-friendly product for network managers primarily interested in early fault detection and quick troubleshooting of complex wide area networks. The system relies on active wired, wireless, and virtual sensors that continuously test connectivity and application performance. Cisco customers that have an Integrated Service Router at remote branch offices can easily deploy NetBeez monitoring agents as ISR virtual services. As a Cisco Preferred Solution Partner, NetBeez has achieved Cisco compatibility certification for one solution, and can provide its customers with 24-hour, 7-days-a-week customer support. For more information on NetBeez, go to: marketplace.cisco.com/catalog/companies/netbeez-inc.
Additionally, NetBeez is an exhibitor at Cisco Live on June 26-29 at the Mandalay Bay in Las Vegas. NetBeez is located at booth 2900 in the World of Solutions and booth i14 in the Cisco Investments Pavilion. NetBeez CEO Stefano Gridelli will host a session titled Distributed Network Monitoring with Raspberry Pi on Tuesday, June 27 at 3:15 p.m. and Wednesday, June 28 at 11:45 a.m. in the Investments Pavilion Theater. For more information on Cisco Live, visit: ciscolive.com/us/. NetBeez, Inc. was founded in 2013 and provides the only fully-scalable network performance monitoring solution designed for network managers interested in early fault detection and quick troubleshooting of complex wide area networks. The system relies on wired, wireless, and virtual sensors that continuously test connectivity and application performance, allowing network problems to be detected before they affect the end-user. This proactive identification and troubleshooting of complex network issues significantly reduces IT’s time to resolution. Please visit netbeez.net for further information.